2 Is Mexico City Safe? Our first day in Mexico City was a Monday, which meant most of the museums in town were closed for the day. It was the perfect day to make the journey to Xochimilco. 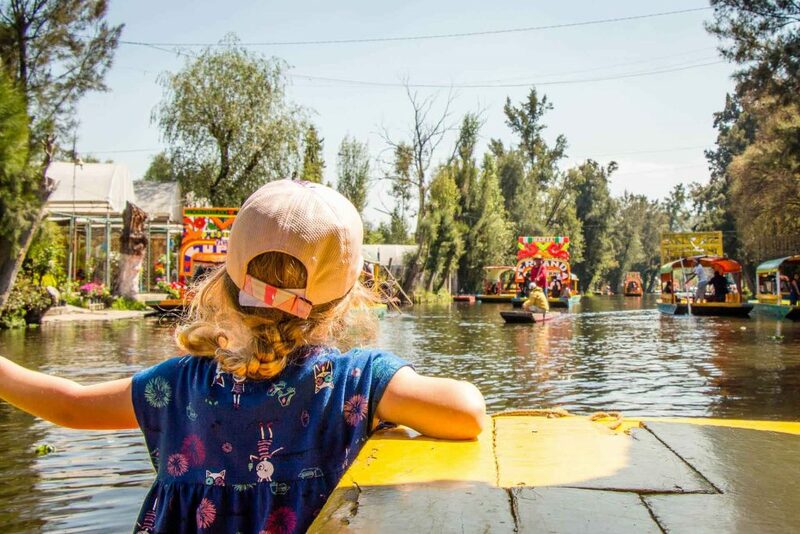 A trip out to Xochimilco with kids is a great way to have a fun and relaxing day in the suburbs and on the water in the famous Mexico City canals. We waited until 9am to avoid rush hour, then we took the L2 Metro from the Hidalgo station to the Tasquena station where we transferred to the TL1 light rail line to the Xochimilco station. The subway was still pretty crowded, but it wasn’t too bad. The kids were able to stand and hold onto a bar for stability most of the way. Our first stop in Xochimilco was the large local market. We love walking through local markets and enjoying the hectic energy in the air. There was everything you could need on offer; fruits, veggies, meat, fish, clothes, toys, etc. The fruit and vegetable displays are works of art! The market is home to many restaurants, so we stopped at one for an early lunch. We ordered the kids cheese quesadillas, while we split an order of salsa verde and mole enchiladas and an order of carne asadas. 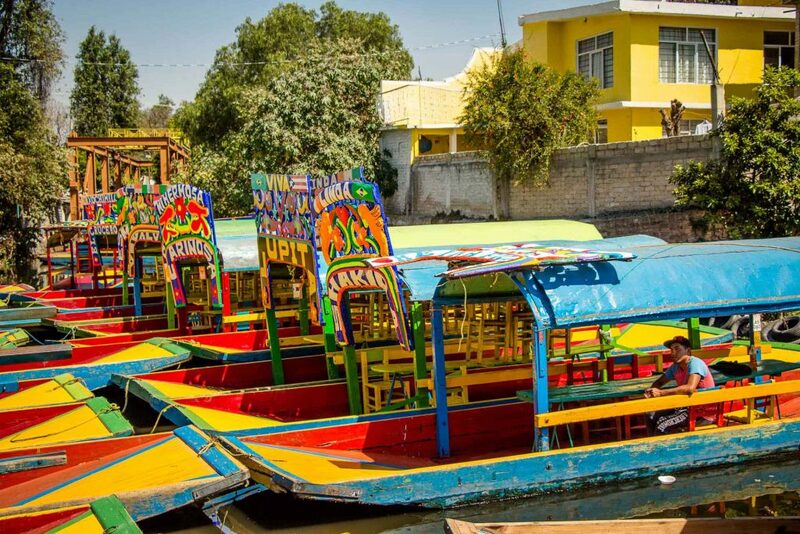 From there, we walked to the Salitre Pier to rent a boat for a trip down the famous Xochimilco canals – think Venice canals, but with a vibrant Mexican flare. 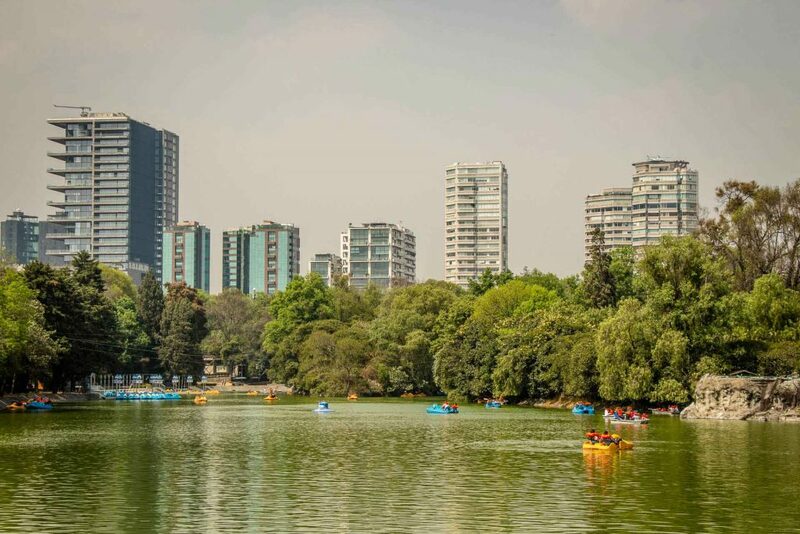 Much of the land Mexico City was settled on was originally a lake and these canals are remnants of that era. We rented a boat for an hour for 350 pesos (~$18usd), which was negotiated down from the original asking price of 500 pesos. Each boat is painted in vibrant colors, has a table along the middle and a roof overhead for sun protection. As in Venice, these large boats are powered by a man with a long stick. There is a very festive atmosphere on the water, thanks in large part to the ever-present music from the floating mariachi bands, who will attach their boat to yours to perform a song (for some pesos of course). 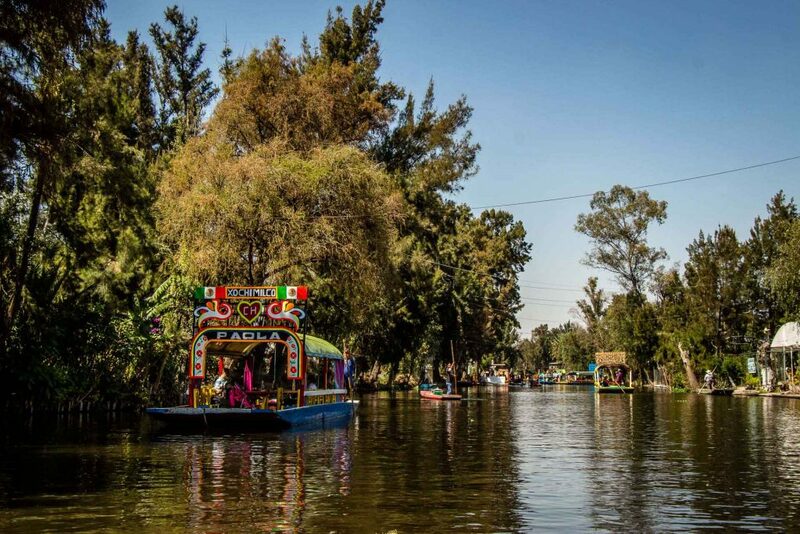 Xochimilco is also a floating market with many vendors offering tourist trinkets, snacks, drinks, jewelry etc. The vendors got to be a bit much at times, but it didn’t ruin the experience. Most visitors who rent boats will have a self-catered picnic with food and drink purchased at the market beforehand. We had already eaten at the market, so we just sat back and enjoyed taking in this unique experience. The kids loved the experience and said that they wished we had rented the boat for 5 hours instead of 1. The kids liked the fancy colorful boat, the upbeat, fun mariachi music, the ducks, the dogs & cats along shore and even the (very creepy) dolls on the Island of the Dolls. Although the kids complained the ride was too short, we felt an hour was just about right. Given our trip was mainly sightseeing with the kids and not having an onboard party, any longer would have been too much. 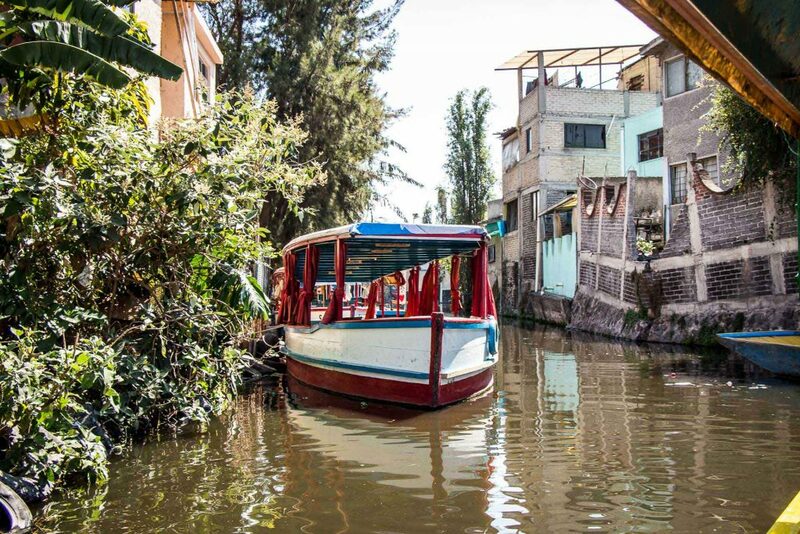 If you are wondering how to see the Xochimilco canals without an hour on the subway, many great Xochimilco tours are available. As a bonus many of these tours bundle in other attractions which are outside central CDMX. 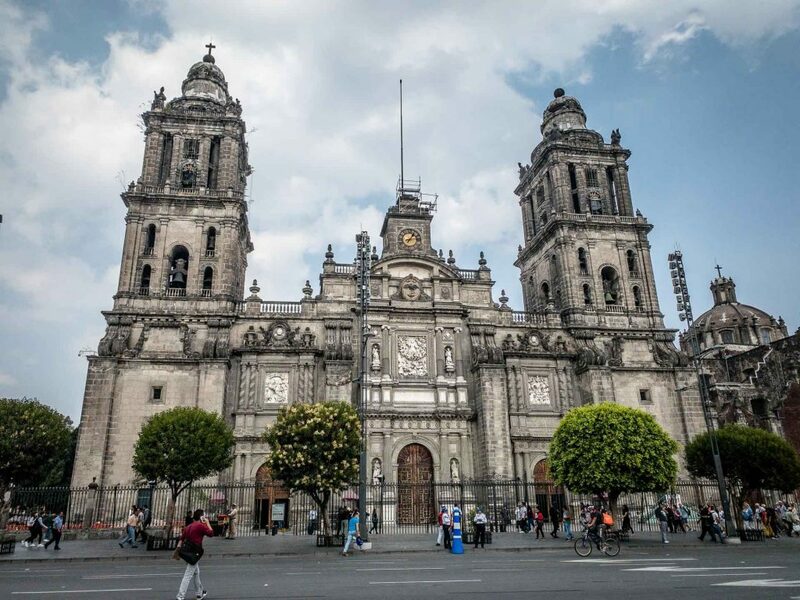 We highly recommend it as one of the top things to do in Mexico City! 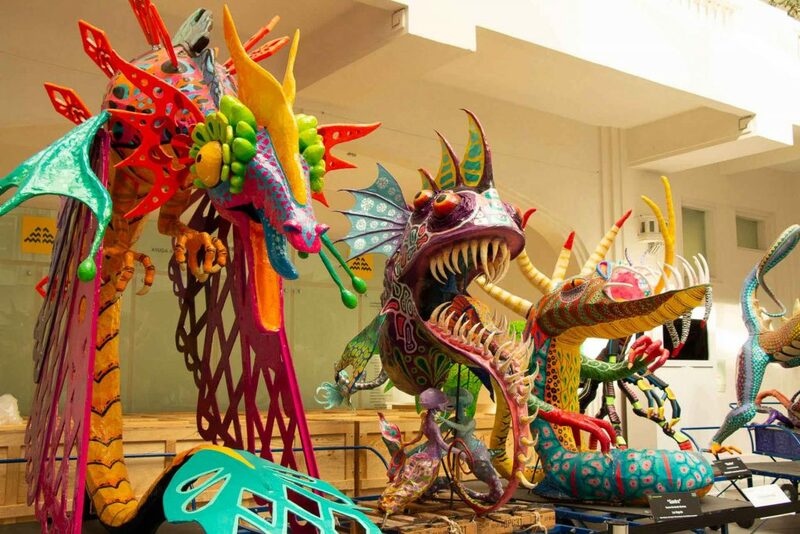 Included on our must-see list of Mexico City attractions were some of the museums. We began our day by walking to the Museo de Arte Popular and got there shortly after it opened at 10am. The first exhibit on the main floor was AMAZING! The building has an atrium which rises to the top of the building 4 stories above. 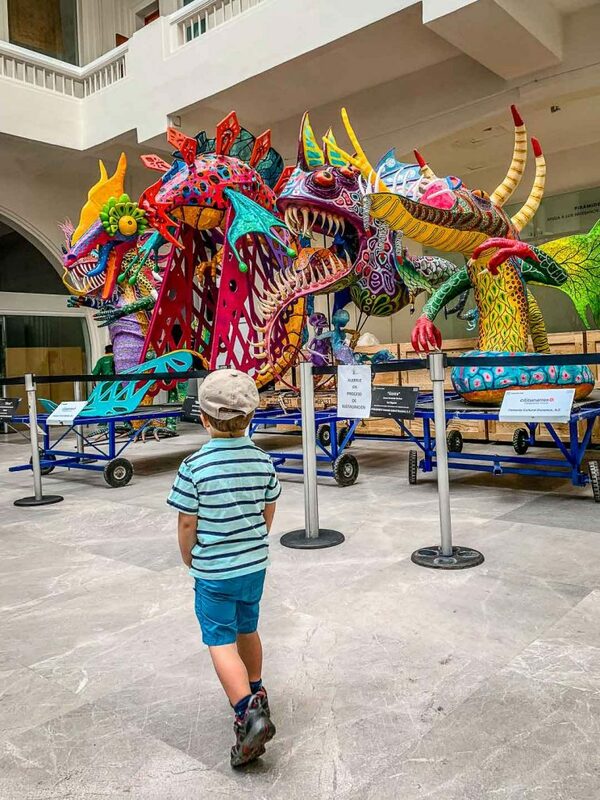 In the atrium were a collection of very large sculptures of amazing mythological creatures with the most vibrant colors you could imagine. We were blown away at the talent of the artists and the kids had so much fun debating which of these fantastical creatures was their favorite. We then took the elevator to the top floor and made our way through the exhibits to the bottom. The museum is jam-packed with amazing Mexican art. The kids liked that most of the art was sculptures as they tend to find paintings boring. The art is so colorful and creative that it will captivate the whole family. 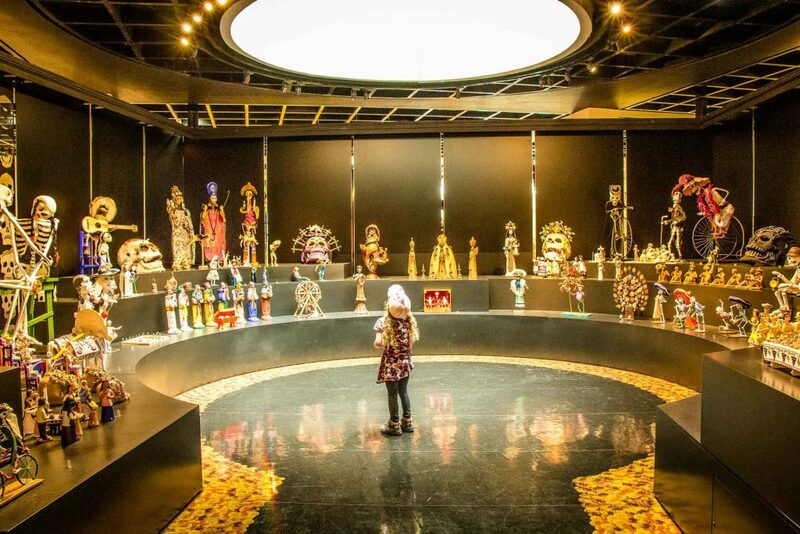 This is one of the best family-friendly museums we have ever been to anywhere in the world. 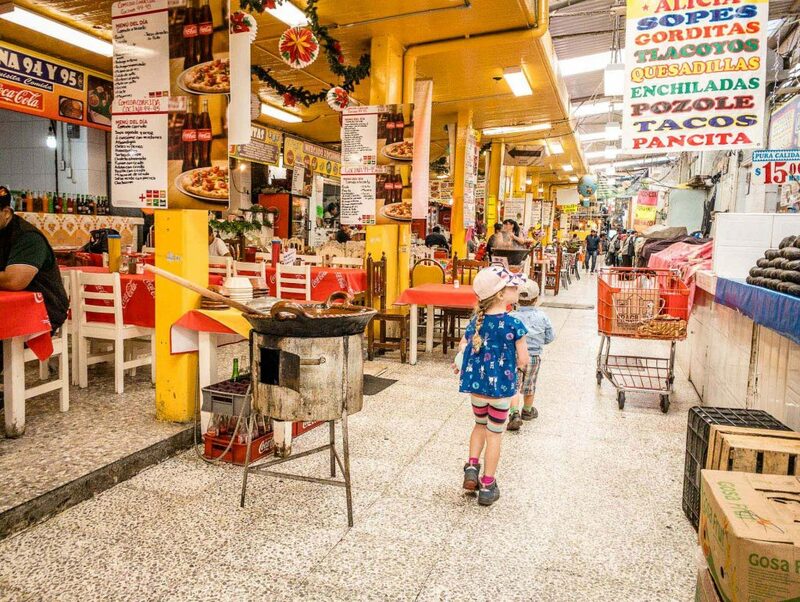 If you are traveling to Mexico City with kids, this is one of the top Mexico City activities to do. It gives your kids a huge dose of culture, but they’ll be having too much fun to notice! Just keep an eye on your kids as we found the museum workers to be watching us very closely to make sure the kids didn’t get too close to any of the exhibits. Next we walked north a block to the giant city park Alameda Central. 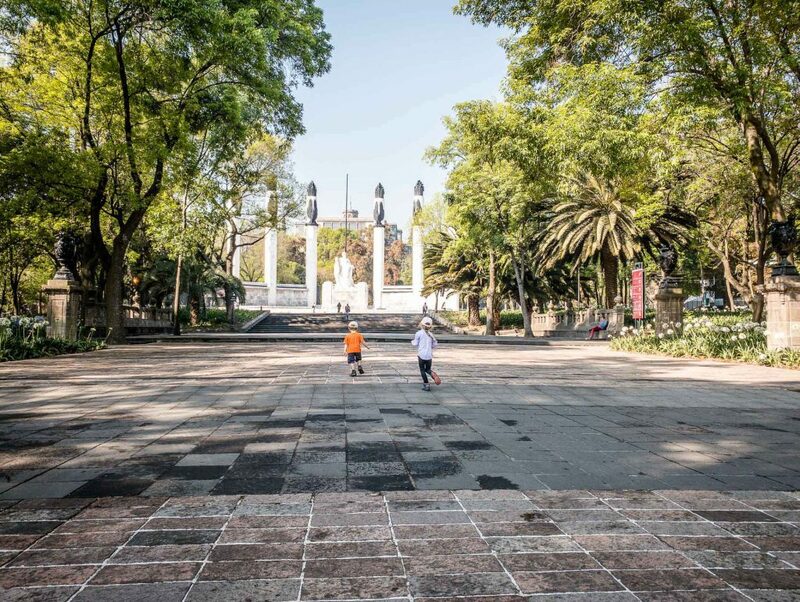 Full of trees, artwork and park benches, Alameda Central is a popular gathering place for locals. In a city as massive as this, it was nice to spend a little time amongst towering trees. We were able to let the kids run a little bit, but due to our safety concerns, we still kept them closer than we usually would. We accomplished this with an epic game of Red Light, Green Light. 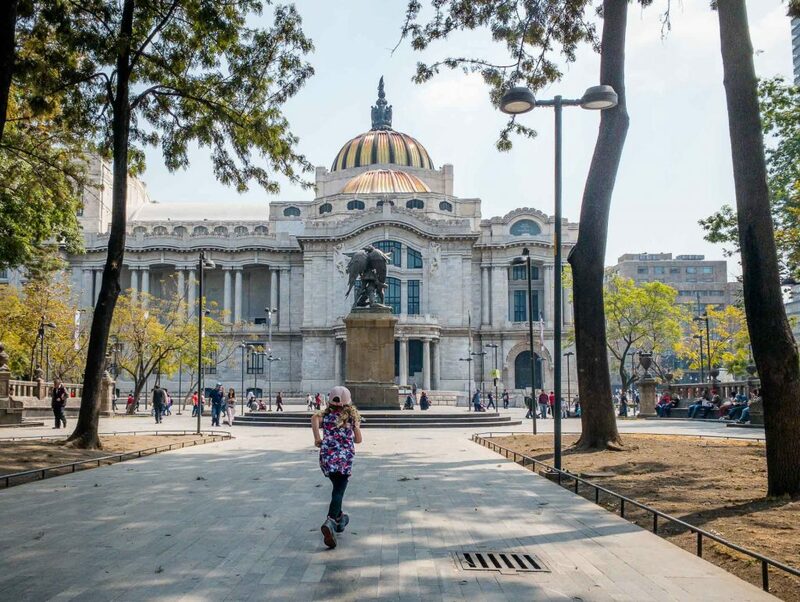 At the east end of the park is the imposing, yet beautiful Palacio de Bellas Artes. If you’ve done any research on Mexico City, you will recognize this distinctive building, with its golden-orange domed roof. The colors of the roof are even more impressive in person with the hot Mexican sun illuminating it. We didn’t go inside as we had no intention of taking the kids to another museum today, so we simply walked around it slowly, taking in the atmosphere and the beautiful architecture. It was nearing lunch and the kids were starting to get a bit crazy, so we let them burn off some energy putting on ‘shows’ on some of the elevated platforms in the area. Continuing along 5 de Mayo, we soon came to the next cluster of attractions, beginning with Zocalo, one of the largest city plazas in the world. The plaza is empty except for a single, massive Mexican flag flying proudly in the middle. The plaza is surrounded by important, yet beautiful buildings, including the Cathedral and the Presidential Palace. We took off our hats and entered the Cathedral for a quick visit. This enormous church is quite dark inside, but elaborately decorated. There was a mass in session during our visit and a large area of the church was blocked off, so we kept our visit reasonably short. Continuing a short ways north, we arrived at the Templo Mayor archaeological site. 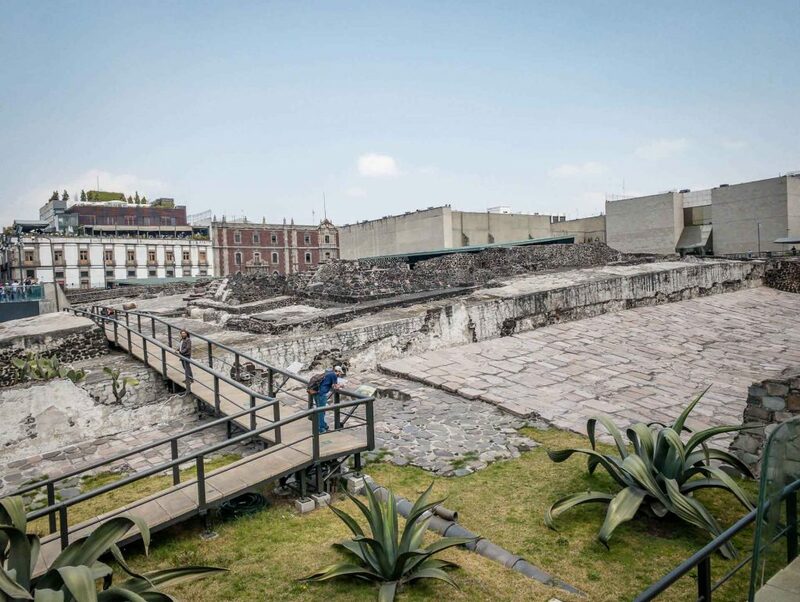 Templo Mayor was the center of the Aztec universe, but sadly today there is not much left of it as it was largely destroyed by the Spanish in 1521 to make room for the Cathedral. Much of the remaining archaeological ruins can be viewed for free from viewing areas along the street. We had originally planned to go into the museum to see the ruins up close, but the free viewing areas were so good, we didn’t feel the need to go in. We hear the museum is excellent, but again, we felt the kids wouldn’t put up with a second (and significantly more boring) museum. Next we visited Palacio Nacional, home to the office of the President of Mexico. 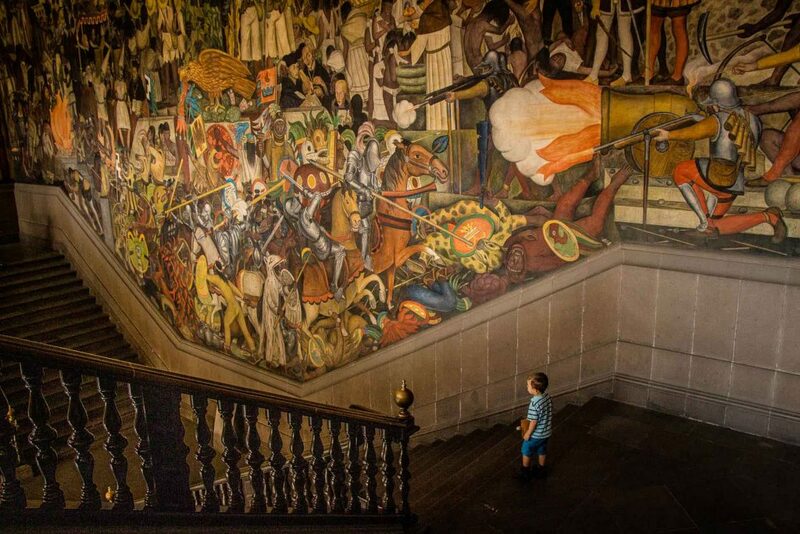 The primary reason tourists flock here is to see the amazing murals by Diego Rivera. It’s free to get in, but you need to bring ID. Walking through the Palace was an enjoyable experience, with beautiful architecture and lovely gardens. The Diego Rivera murals themselves were amazing, especially the one which wraps itself around the staircase leading up to the remaining murals. 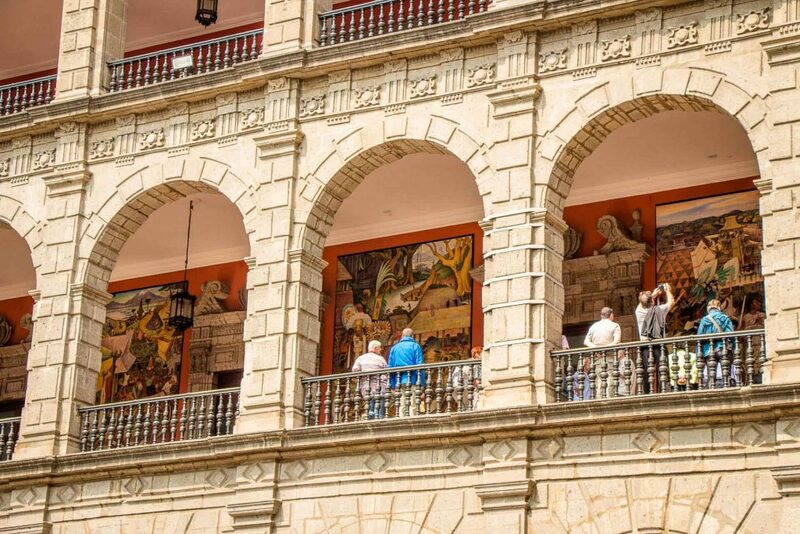 The Diego Riviera murals depict the history of Mexico from ancient times to the present. As is typical of Mexican artwork, these masterpieces are very colorful and highly entertaining, with scenes ranging from violent confrontations to showcasing the good of the people. These murals are definitely worth a visit; our kids didn’t see what the big deal was, but they entertained themselves by running up and down the largely empty long corridors away from the murals. After a long day of walking, we treated ourselves to some freshly cooked, piping hot churros at El Moro, a Mexico City institution since 1935. We got a simple order of 4 large churros with a side of chocolate and condensed milk. The churros were gone faster than a cow that fell into a lake of piranhas; we simply could not help ourselves. When visiting a new place with a unique cuisine, we often find that our kids don’t eat as much as they do back home, so we like to supplement with fruits and veggies. It was surprisingly difficult to find fresh produce around the historic center in Mexico City; although there are candy stands on every street corner. Our problems were solved with a visit to Mercado de San Juan, as recommended by our Airbnb host. We were able to buy mangoes, bananas, cantaloupe, cucumbers and avocados, which kept us well stocked for the remainder of our time here. 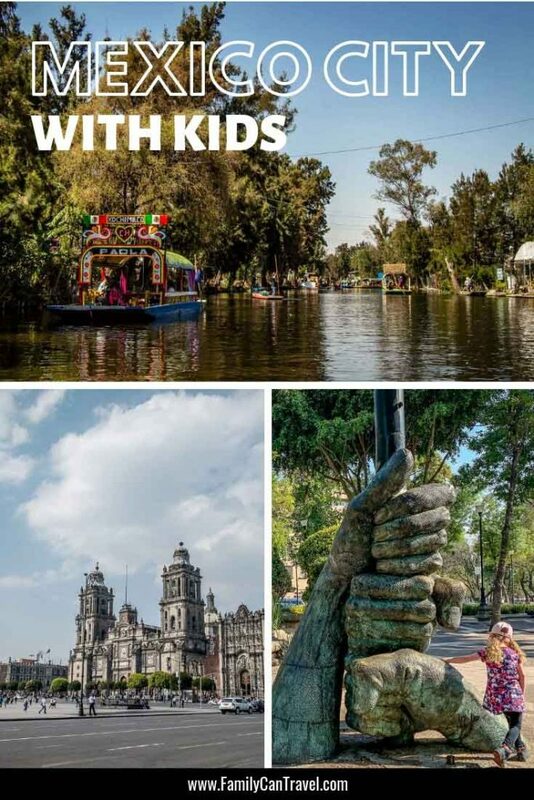 If you’d like to see many of these attractions with a guide, you can book a family-friendly private four hour tour of Mexico City. 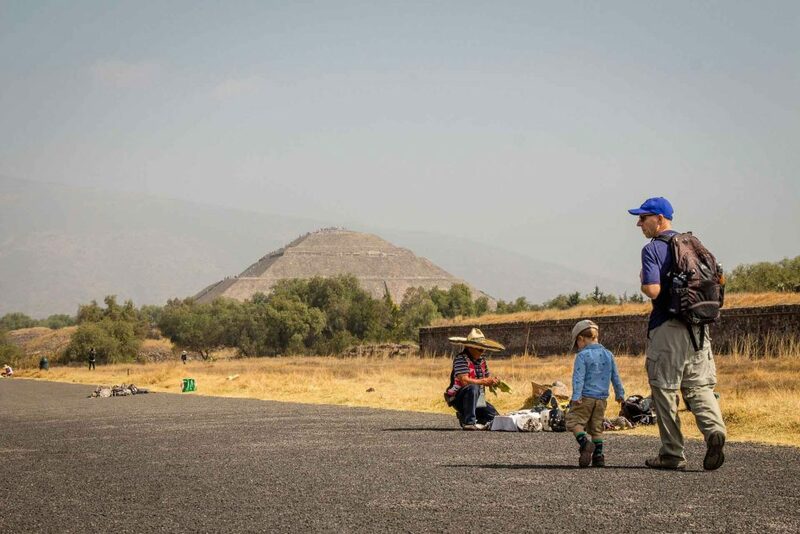 Built nearly 2,000 years ago, the Teotihuacan Pyramids are home to many of the most architecturally significant Mesoamerican pyramids built in the Americas. It’s really easy to get to the Teohuacan Pyramids from CDMX by public transportation or as a day trip. We prefer to do things on our own, so we took public transport. It was a short metro ride to the North Bus Terminal. Taking the metro is super-convenient as it lets you off right across the street from the bus terminal; just simply walk under the road via the metro tunnel. Once in the terminal turn left and walk all the way to the end. You can buy your tickets from “Autobuses Teotihuacan“, which is the second last bus company before the “Sala 8” sign. You can buy one-way or round-trip tickets at this counter. The departure ticket is for a specified time, while the return ticket is good for any bus ride back. Adult return tickets were 104 pesos (~$5.50USD), while the kids tickets are half price. The bus ride through the outskirts of Mexico City was very interesting and offers a glimpse of life here which most visitors don’t get to see. Of particular interest were the communities which are built up the sides of steep mountains. These concrete dwellings are painted in many bright colors, which look wonderful when grouped together. The bus let us off here at the south-west corner of the complex. After buying our tickets, we walked through the parking lot to a retail complex selling all kinds of souvenirs and snacks. 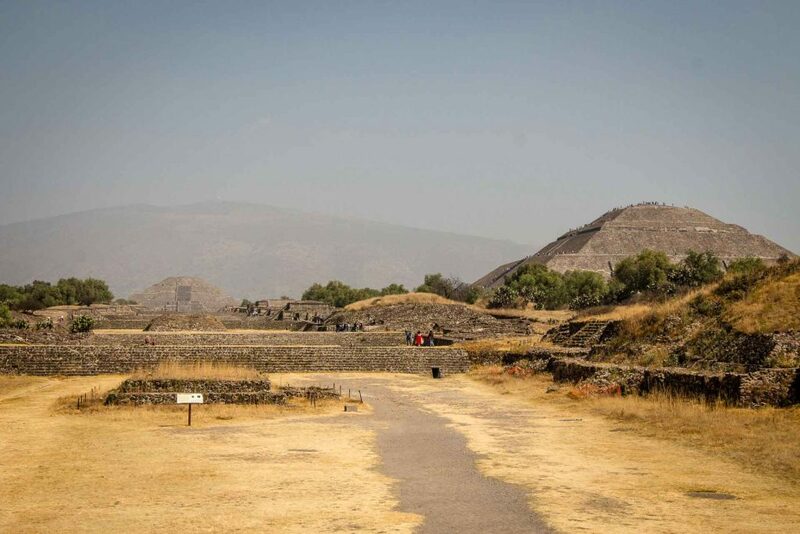 Before long, we were in the complex itself walking north along the main pathway to the Pyramid of the Sun. It was a surprisingly long walk to the main pyramid (around 1 mile / 1.5km) but it was enjoyable. There are minor temple ruins all along the way which keep it interesting. Every so often, a row of stairs cuts across the main path which you need to climb up and over. There are tunnels that run under the stairs, which our kids loved to crouch down and walk through to the other side. The tunnels were reasonably short and large enough that a parent could get into if need be. Looking for another day trip or destination close to Mexico city? 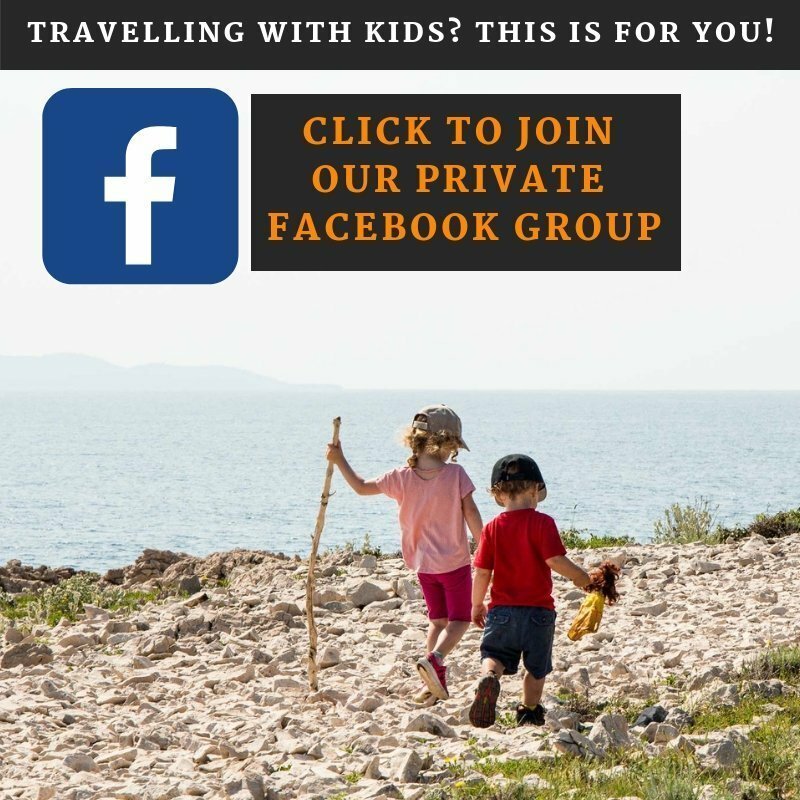 Don’t miss the incredible Valle de Bravo with kids (COMING SOON). We stopped for a well-deserved lunch at the base of the pyramid. Once we were all fueled up, we started our climb up the 248 steps to the top. The stairs are in good repair and are much safer than those we encountered while visiting the Mayan ruins of Coba. There are ropes to hold on to if required, which our kids used at our request for an extra measure of safety. The climb to the top is split into several small sections of stairs which lead to landing areas where you can stop, rest and enjoy the views of this amazing complex. Some of the landing areas are actually pathways which circumnavigate the pyramid. It didn’t take us long to climb to the top; around 15-20 minutes. It was actually pretty easy and our kids were able to climb the whole way up themselves. The top of the pyramid is quite large, allowing for a lot of people to enjoy the views at one time. 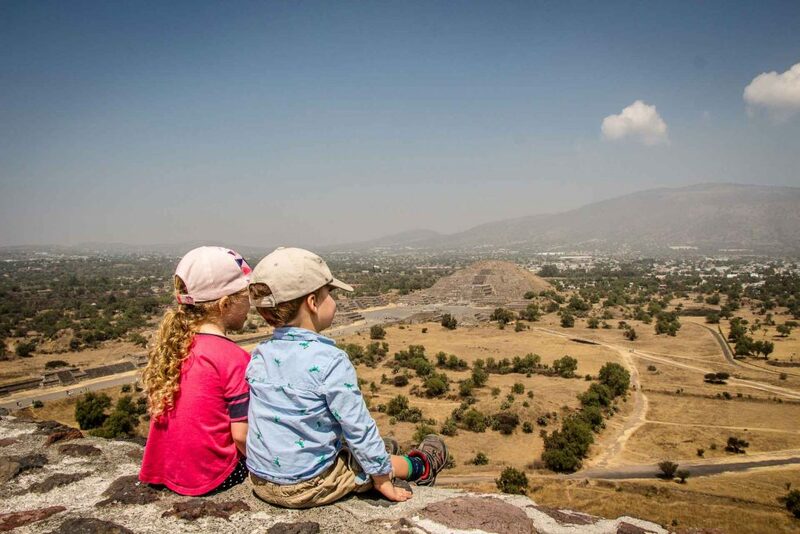 The views from the top of the Pyramid of the Sun are incredible and well worth the effort. Our daughter was able to climb back down herself, but for safety reasons we carried our 3 year old son most of the way down. We elected not to walk the rest of the way to the Temple of the Moon for a few reasons. It looked like you could only climb halfway up, and at the time of day we were there, the view of the Pyramid of the Sun would be completely backlit. The kids were doing so well energy and mood-wise, that we didn’t want to push them too hard. So we enjoyed a leisurely walk back to the bus stop, with the kids making sure to go back through all the tunnels they enjoyed on the way. 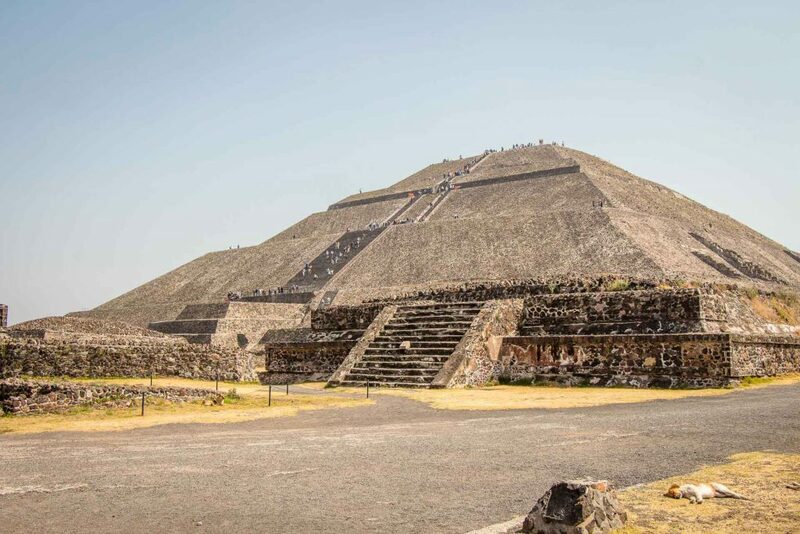 If you’d prefer to see the Teotihuacan Pyramids with a guide, we suggest this popular 5-star private tour from CDMX with an archaeologist. 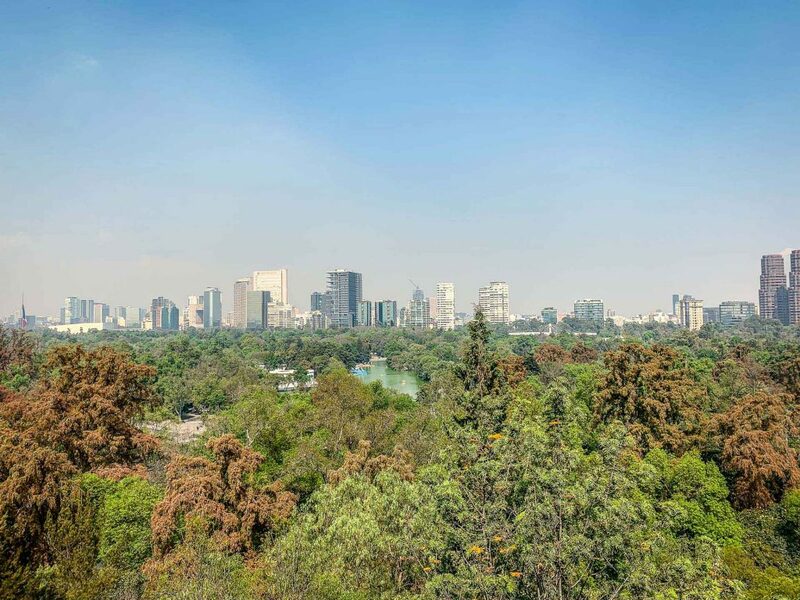 We spent our fourth day in Mexico City in Bosque de Chapultepec, Mexico City’s greatest city park. 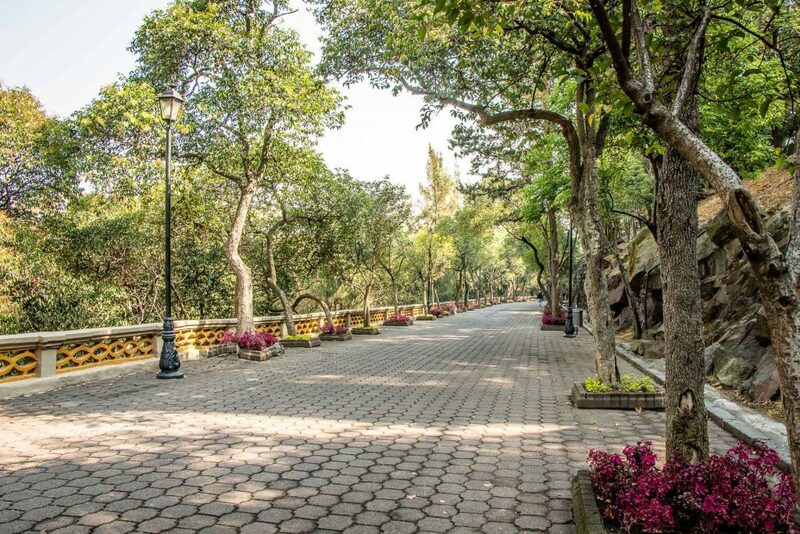 Upon leaving the Chapultepec metro station, we entered the park and immediately felt a wave of relaxation. Mexico City can be a pretty intense place and to suddenly be surrounded by tall, green leafy trees along with relative calm and quiet is so good for the soul. Although I’m sure there can be trouble in the park, it felt safe and we were able to let the kids run and blow off some steam. This was a big treat for them as we had kept them close in the city. After crossing the bridge leading into the main section of the park, we stopped to admire the strong, white pillars of Altar a la Patria which commemorates the six teenaged boys who died defending the Castillo de Chapultepec from invading US forces in 1852. 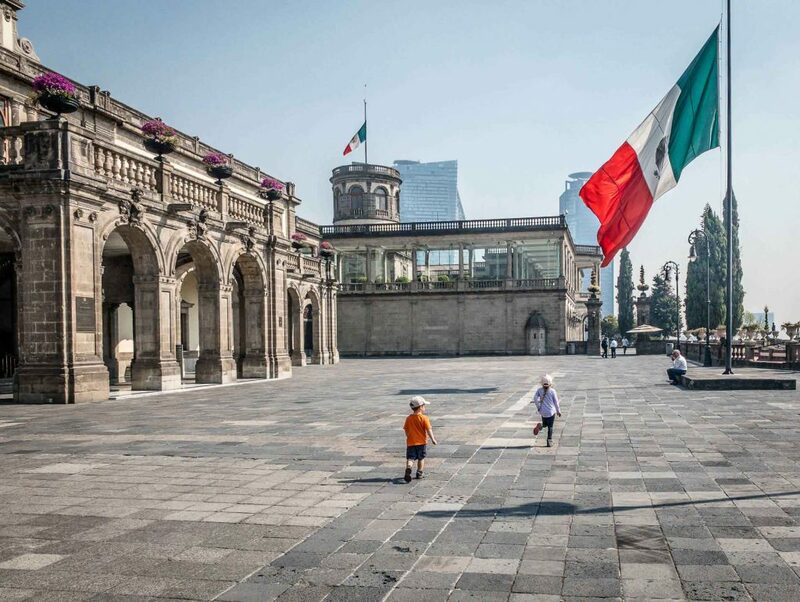 Castillo de Chapultepec was built in 1785 for the Viceroy of New Spain and subsequently served as the official residence of the President of Mexico until it became a museum in 1939. All visitors must go through a security check prior to entering the grounds of the castle. If our level of relaxation had increased from a 1 to a 5 upon entering the park, it was now a 9. Ahhh… no worries in the world up here! The walk to the castle is long and slightly uphill, but anyone in reasonable shape can do it. The pathway is beautifully landscaped and offers nice views of the surrounding city below. Our kids walked the whole way, but they were pretty slow given the slight uphill. The castle is pretty amazing; I mean it’s a real castle… in Mexico! Crazy! Being up here with kids, the best parts were the beautiful gardens and the amazing views of the city below. The interior of the castle is a museum, which was pretty boring for our little guy, but our 5 year old daughter had fun looking at all the stuff that belonged to the Queen (she thinks every castle has a Queen…). Afterwards it was time for lunch and we walked west towards the lakes. We found a series of outdoor restaurants in the area immediately east of the lakes. The restaurants looked indistinguishable, so we randomly picked one that had hot dogs for the kids. We were pleasantly surprised at the quality of the Mexican food we ordered too! After lunch, we sat by the lake and treated ourselves to some brightly colored ice cream from a nearby vendor. We spent the remainder of the afternoon taking a leisurely stroll through the pathways south of the lakes. 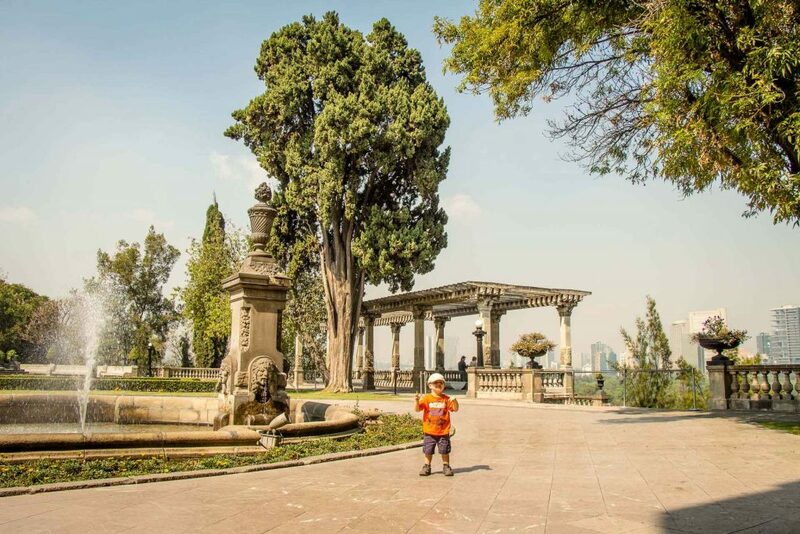 Bosque de Chapultepec is such a beautiful park, we were just happy to do nothing but be in it and let the kids run or walk at their own pace – something they rarely get to do while traveling. We even stumbled across a beautiful two story, golden carousel near here. 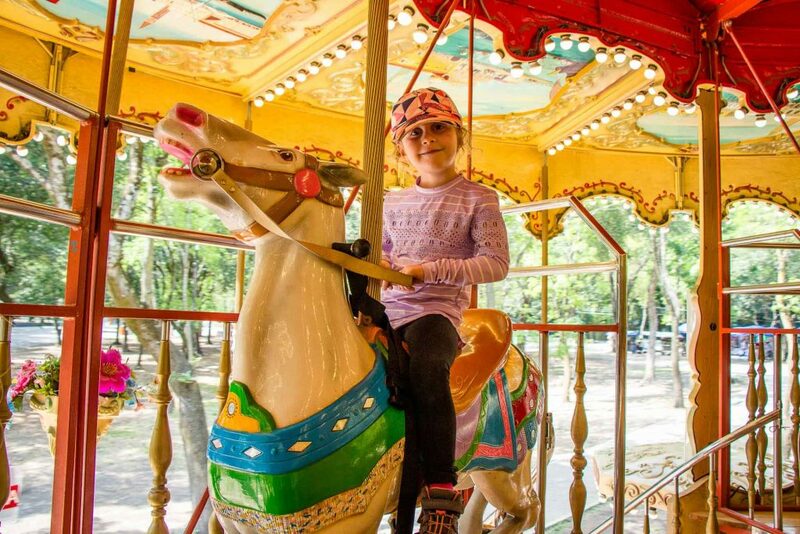 Our daughter loves carousels, so we stopped for a fun ride. 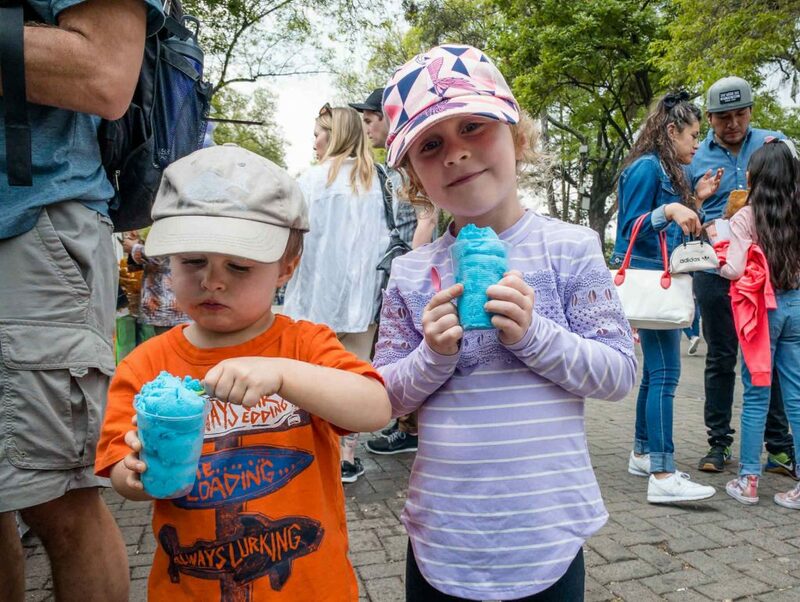 On our final day, we planned on doing one of the most fun things to do in Mexico City for kids. 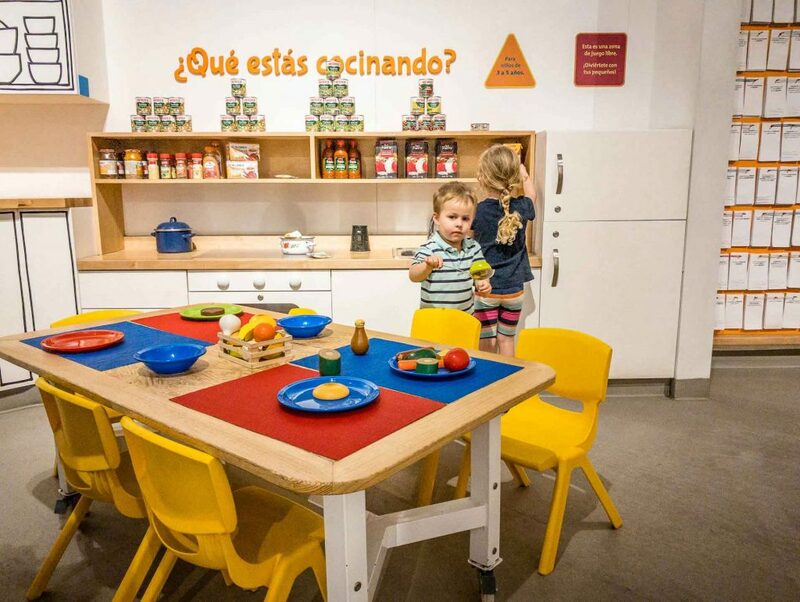 We visited the Children’s Museum (Papalote Museo del Ninos), which is located in Section II (the middle section) of Bosque de Chapultepec. We thought it would be a good idea to take the metro to the Chapultepec metro station and take a leisurely walk through Section I (the eastern section) of the park to the museum, but it wasn’t. We’ll spare you the details, but it was really hard to cross over from Section I to II. We recommend taking an Uber or a public bus (which requires a smart card for fare payment). As it turns out, we entered the grounds of Los Pinos, which until very recently (Dec 2018) was the home of the President of Mexico. The grounds are now open to the public, but there was obviously something important going on based on the amount of heavily armed military there. Don’t get me wrong, this was an amazing experience. The grounds were beautiful, there were busts of all the former Mexican presidents along the way and all the military personnel were very friendly to us. It was simply a little unsettling at first not knowing what we were walking into, but it turned out to be one of those amazing travel experiences you only get when you are out exploring on foot. Papalote Museo del Nino was a ton of fun. Our kids appeared to be the only foreigners there, but they were welcomed into the fun with no issues. 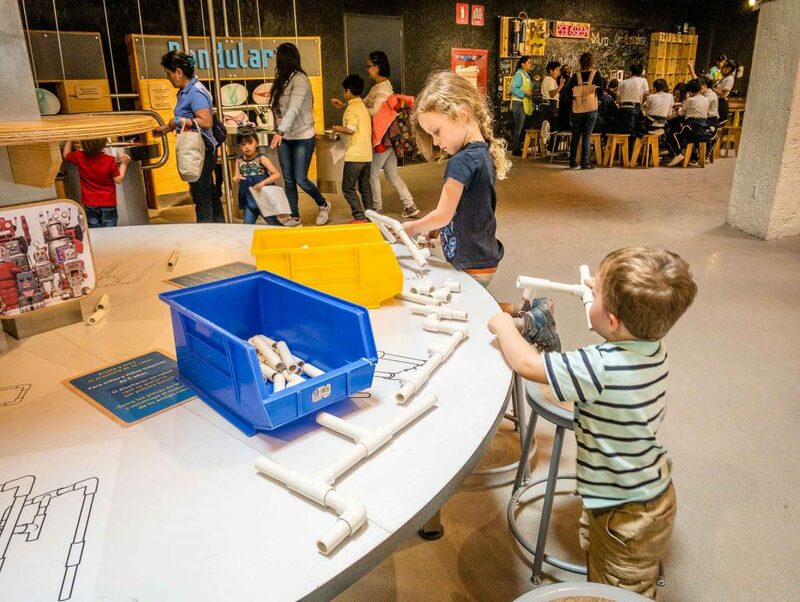 The museum is so big and colorful, and is filled with hands-on activities for the kids. There’s a section on the human body which includes a giant stomach to jump around in, a big esophagus to crawl through, giant teeth to brush, and much more. There’s a section about local wildlife and a section about life at home. Upstairs is another huge area with lots of crafts and activities for the kids, and outside are interpretive gardens. We were there for many hours, including lunch at their food fair (featuring lots of American fast food chains). The kids had an amazing time and were really upset when it was time to go. We were there so long, we abandoned our plans to go to the Museo Nacional de Antropología, but that’s ok. 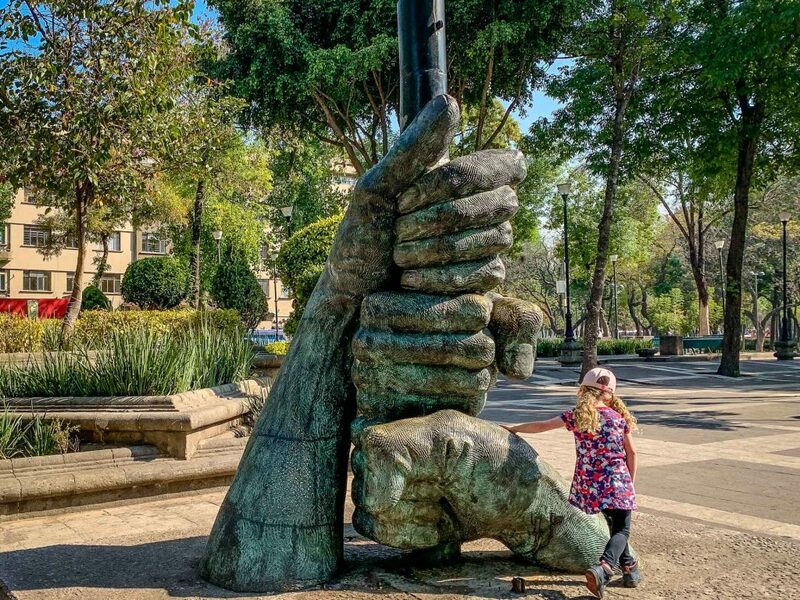 This was one of the best things to do in Mexico City for kids! 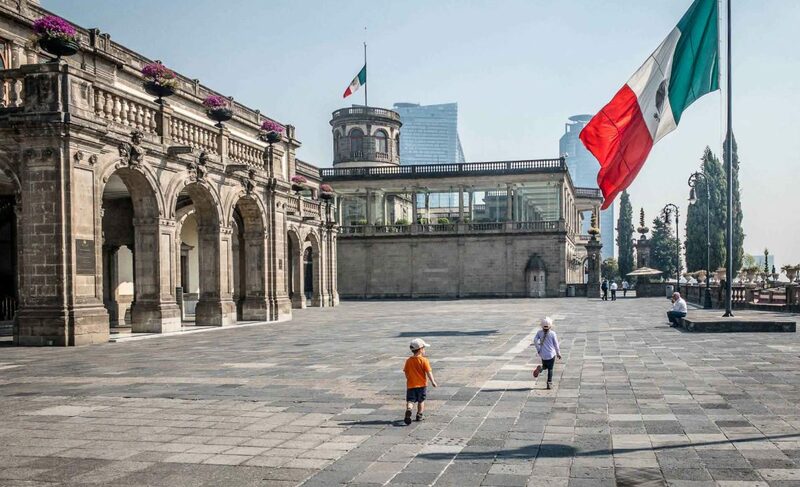 Mexico City is one of the world’s largest cities, so of course there will be sketchy people and sketchy places, but that is true of all major cities. 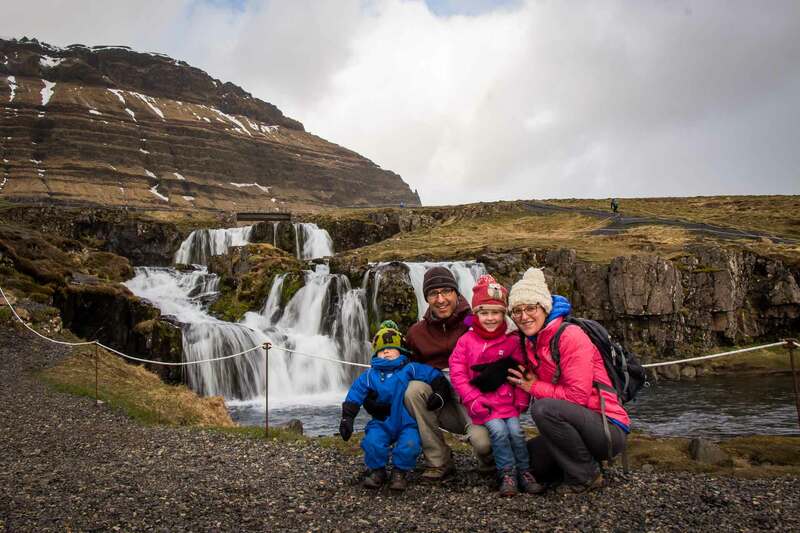 Our experience was that it felt safe, especially in the historic city center. Keep your kids close to you at all times. Most of the local parents keep their children on harness leashes. When exploring on foot, try to stay within the touristy areas as they are well policed and feel quite safe. 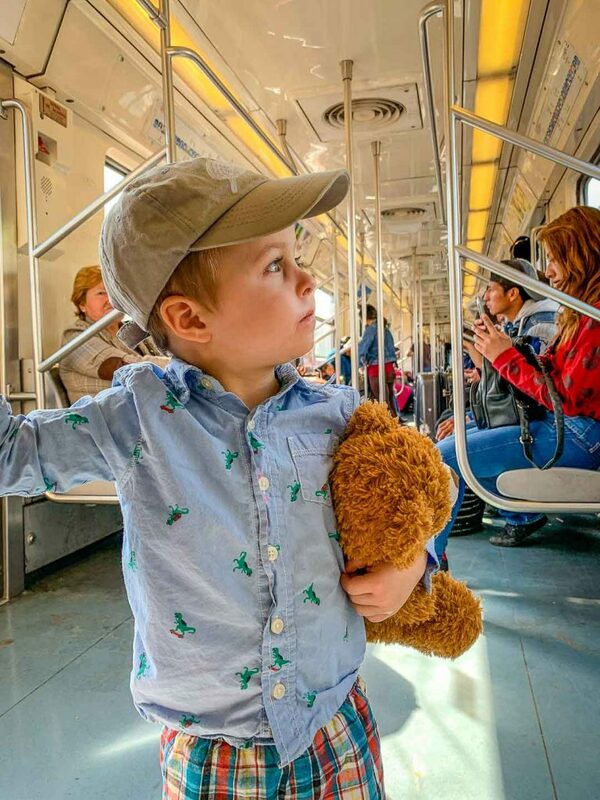 If the subway is extremely busy, women and children can ride in one of the front cars that is strictly for women and children. We did this on one occasion when we took the subway too close to rush hour. The women made extra sure they kids were safe and not getting squished on the packed subway! As mentioned in the Safety section above, it’s best to stay in areas that are often frequented by tourists as they are generally quite safe. Mexico City hotels anywhere within the historic town center is a good choice. For example, between the Alameda Central and Zocalo. Other options are the trendy, upscale neighborhoods of La Condesa and Polanco. 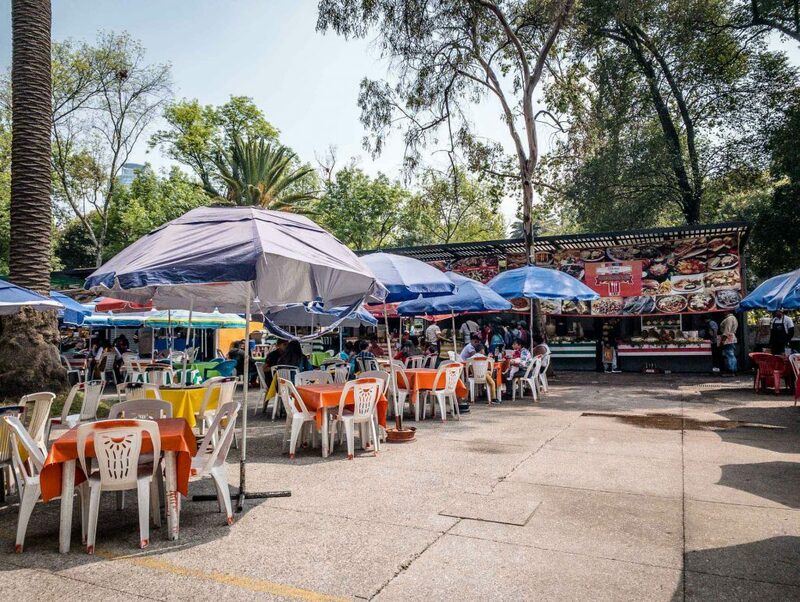 They are close to the Bosque de Chapultepec and are an easy metro or Uber ride to the center. We stayed in a simple, but really nice Airbnb apartment just a few minutes walking distance from Alameda Central. Though we enjoyed it’s proximity to the subway station, it was located just a few blocks outside of the relative safety zone of central CDMX and the park next door was full of prostitutes. 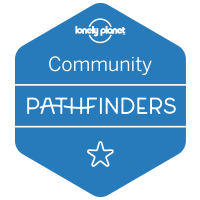 Staying in an Airbnb is a great option for families, but learn from our lesson and try to stick to the neighborhoods suggested above. Thankfully there are lots of really nice family-friendly Airbnb’s in Mexico City. If you haven’t used Airbnb before use our signup link to get $35USD off your first stay. If you prefer to stay in hotels, Hotels.com has identified a bunch of family-friendly hotels in Mexico City. La Pagoda: We stumbled across this family-friendly restaurant in the heart of the historic center on our way from Alemeda Central to Zocalo. It was packed with locals, which is always a good sign. The kids gobbled up their scrambled eggs with ham and cheese, while we devoured our enchiladas. El Kioskito: We loved the take-away tacos from this local’s place near Alameda Central so much we ate here 3 times in 5 days! 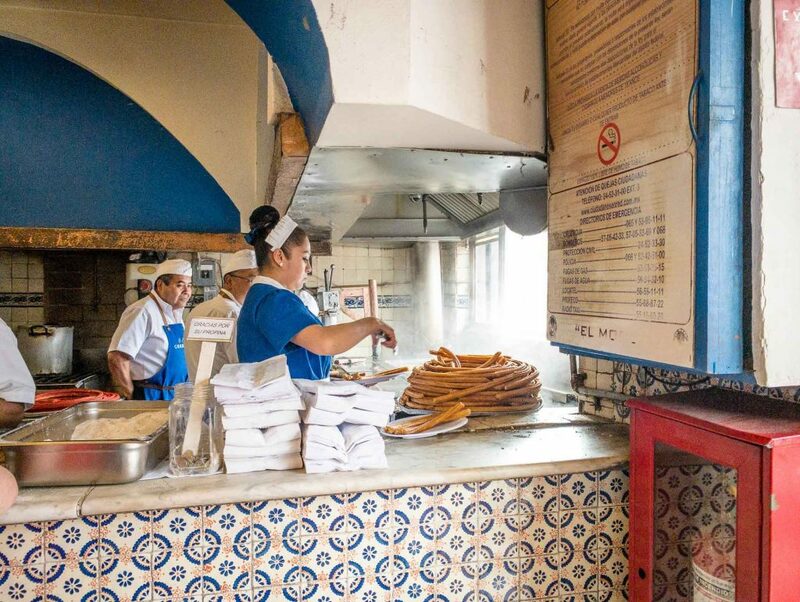 El Moro: Most churros you see are cooked hours earlier, but you can get them piping hot at this CDMX institution. 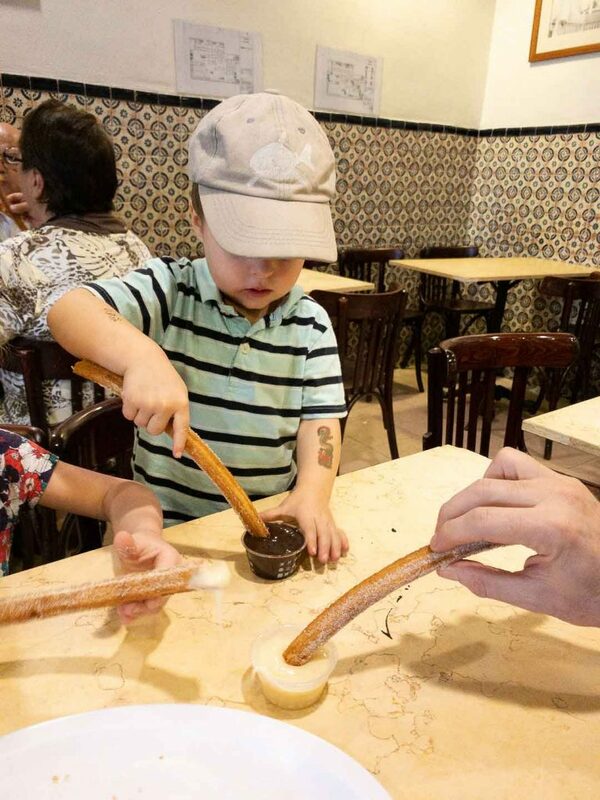 El Moro knows a thing or two about making churros – they’ve been doing it for nearly 80 years! Mercado de San Juan: Fruit and vegetables are surprisingly hard to find in Mexico City. There are no supermarkets in the historic center and the convenience stores (Oxxo & 7-11) do not carry any produce. Mercado de San Juan is a fun shopping experience and has an excellent selection of produce. The mangoes we bought here are the best we’d have anywhere in the world! If you are a little scared by the food & water in Mexico, there are precautions you can take that will help you get through your trip worry free. We have been to Mexico several times and have not had any issues. Two of our top tips for staying healthy in Mexico is to always drink bottled water and disinfect your fruit and vegetables.